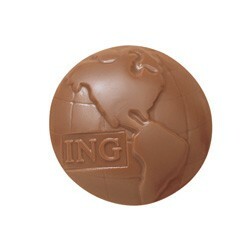 Discover a great chocolate taste with this earthly piece. Perfect for Schools, Teachers and International Organizations to name a few. The imprint are on the Globe is 1 X 9/16". Size : 2 7/8" X 2 7/8"